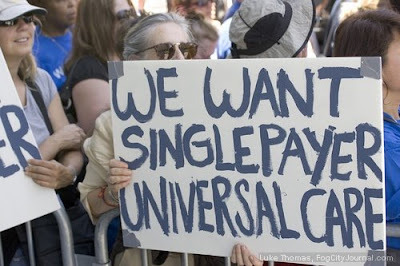 Single-payer health care is a term used in the United States to describe the payment of doctors, hospitals, and other health care providers from a single fund. It differs from typical private health insurance where, through pricing and other measures taken by the insurer, the level of risks carried by multiple insurance pools as well as the coverage can vary and the pricing has to be varied according to the contribution of risk added to the pool. It is often mentioned as one way to deliver universal health care. The administrator of the fund could be the government but it could also be a publicly owned agency regulated by law. Australia's Medicare, Canada's Medicare, and healthcare in Taiwan are examples of single-payer universal health care systems. An approach to health care financing with only one source of money for paying health care providers. The scope may be national, like the Canadian system, state-wide, or community-based. The payer may be a governmental unit or other entity such as an insurance company. The proposed advantages include administrative simplicity for patients and providers, and resulting significant savings in overhead costs. Single-payer health care does not necessarily mean that the government or some government agency delivers or controls health care services. It may pay for health professionals and services that are delivered in either private or public sector settings according to the needs and wishes of the patient and his or her doctor. Single-payer is one alternative proposed for health care reform in the United States, and as such, has been the subject of active political debate for decades. A national health insurance system, though not necessarily a single payer system, is the reform proposal that has the greatest level of support amongst medical professionals and the general public, though some in Congress and the health insurance industry have tried to deflect calls for such reform by insisting that the U.S. should adopt a "uniquely American solution" that would protect the profits of private insurers, thus ruling out a single-payer system. B4B Note: The health insurance industry is blatantly and disgustingly spending millions of dollars to lobby (bribe) politicians against single-payer. Even sadder is the fact that our politicians are taking the bribe money and agreeing to doing everything they can to block this much needed health care reform (and basically everything else President Obama proposes). It is not surprising that the 'Just Say No' Republicans are dedicated to blocking progress for We The People, but what is pitiful is the so-called 49 member 'Blue Dog DEMOCRATS' or DINO's (Democrats In Name Only) who will do whatever it takes to get a chunk of the bribe money...in exchange for turning their backs and voting against We The People. As a concession (which Presidents are forced to do at times), President Obama has opted for what is now called a Public Option which will be a combination of a form of Single-payer 'competing' against health insurance companies. Although this plan is far from the effectiveness of Single-payer it does serve as an incremental improvement of our current health care system. Problem is, many Blue Dogs want to block even that ! (because health insurance companies don't want any competition) Click 'Public Option' above to view President Obama's Health Care Townhall or read text in which he explains why he favors Public Option. It is of vital importance that we know who these Blue Dogs are...contact them to let them know that we are watching their every move...and send them the message in record numbers that if they vote against us...they will not be voted in again. WHO ARE THE BLUE DOG DEMS ? BLUE DOG DEMS MUST BE STOPPED ! THEY ARE SABOTAGING PROGRESS !